Founder & CEO, Up2Us Sports. Nonprofit Leader, Sports-Based Youth Development Expert, Writer and Advocate for Youth Development. Okay, I know everyone in the sports world is aware of a certain kind of trauma that is caused by high impact sports and is exacerbated when that impact occurs to the head. Yes, brain injury is a type of trauma that we all must take seriously. But there is another kind of brain injury that is also prevalent in our society. Its source is different than physical impact, its consequences are detrimental, and it can lead to poor health outcomes of equal magnitude. I am talking about the mental trauma that is caused by constant exposure to stressors like poverty, violence, substance abuse, physical abuse, sexual abuse, and other kinds of negative behaviors. This kind of trauma impacts people everywhere but tends to be more prevalent in low-income communities. In fact, some studies suggest that populations of youth who are regularly exposed to these kinds of traumatic events have a greater prevalence of PTS and PTSD - the acronyms for traumatic stress disorder normally associated with the military - than veterans coming home from war. But there’s a major difference between this trauma and physical trauma as it relates to sports. This trauma is cured, not caused, by sports. Yes, I mean basketball, soccer, baseball, football, and lacrosse. We know through neuroscience that victims of mental trauma often experience a complete shutdown of the centers of the brain that are responsible for important behavioral controls like social discipline, self control, and Plan B thinking. To put it bluntly, the traumatized brain cuts off all activity except from its most primitive part, the amygdala. The amygdala is the source of our “fight, flight or freeze” response. Knowing this, it’s not difficult to recognize how many perpetrators of violence are actually acting out a traumatic response to the environment around them. Similarly, many youth who choose to drop out of school or run away from home are often exhibiting a type of “flight” symptomatic of trauma. Here’s where sports come in. We also know one simple fact from neuroscience: regular physical activity stimulates neurological brain responses and growth. In other words, exercising every day teaches the brain to heal itself and forces the brain to connect to its frontal lobe, which is responsible for more rational responses to the stressors in our every day life. But there’s more to the healing power of sports than just that. Sports actually provides a setting that is safe, that has well prescribed rules, that has peer support, and that is overseen by a mentor, the coach, who is there to offer encouragement. Yes, everything about these characteristics of sports is the antidote to trauma. Trauma occurs when there is fear, a lack of consistency, and few, if any, social supports. And oh yeah, there’s still more than that. If you look specifically at the skills that are inherent to any sport activity, you witness some of trauma’s best medicine in its purest form. For example, sport forces the brain - and by this I mean the frontal lobe again - to practice all sorts of healthy functioning skills. For the brain, “where is that defender right now?” translates to “what’s the present situation and how do I navigate accordingly for the best possible results?” For the brain, when your game plan proves unsuccessful with three seconds left on the clock, the frontal lobe translates that to “what’s my Plan B in this present circumstance with these time constraints?” Even the concept of having a strict set of rules forces the brain to recognize how certain constructs can best be navigated to lead to an ultimate goal: victory. And being able to cooperate, coordinate and synchronize all of this brain functioning with teammates is yet another mental health skill: social confidence. During the last seven years my organization, Up2Us Sports, has focused on the connection between sports and trauma reduction. After two longitudinal studies, we have witnessed a correlation between the essential characteristics that are unique to sports – 1) physical fitness, 2) positive peer group, 3) coaches as adult mentors, and 4) life skills intrinsic to the game – and healthy mental functioning. 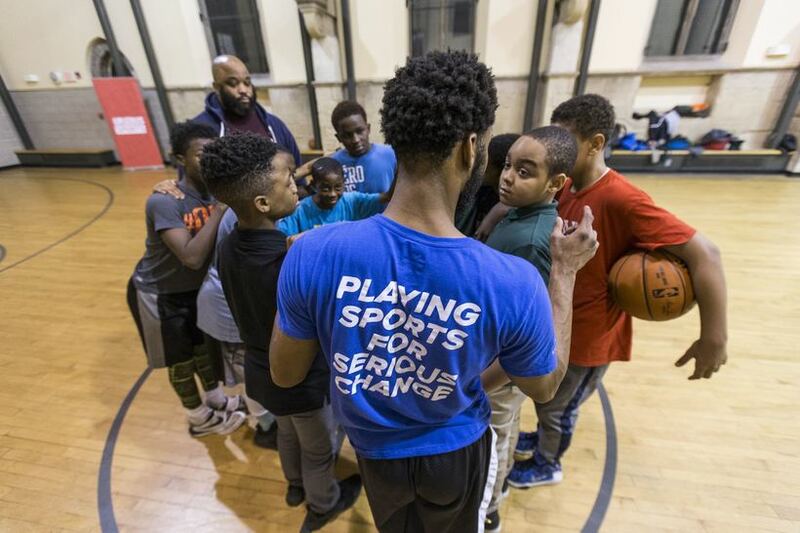 City by city across the nation, Up2Us Sports is now training coaches and supplying coaches who are trauma-informed to schools, parks and nonprofits. But this effort requires a particular focus on delivering sports through a trauma-informed framework. In other words, it just doesn’t happen naturally. The coach has to understand the environment that they are working in and the stressors that their athletes face. The coach also has to be intentional about how they lead their teams. In Los Angeles, I met such a coach. One of the golf coaches we had recently placed in East Los Angeles was a trauma-informed coach. When one of her golfers was triggered by an event while trying to putt the ball, he actually threw his club. His traumatic outburst frightened many of the other players and volunteer coaches in his program. But this coach was trained to understand the symptoms of trauma and to make a concerted effort to learn the young athlete’s story so she could better understand his behavior. That athlete was growing up in a single home, several members of his family were incarcerated, and his grandmother was struggling to make ends meet. Just the slightest episode of failure triggered a “fight” reaction. The trained coach immediately pulled the young golfer aside and sat with him for twenty minutes - the average time it takes for someone who is traumatized or stressed out to calm down and return the amygdala to normal functioning. Then the coach talked with the athlete about his behavior and what consequences it had on his teammates and the other coaches who were present. It was at this point that the young player was able to recognize the implications of his conduct and to reflect on whether or not he could have responded differently. With assurances to the other coaches, the trained coach was able to bring this golfer back onto the course. Later, the coach was able to point out the positive mental health attributes the golfer showed during the rest of the tournament, and to remind him that he has the skills to overcome stressful and traumatic events without resorting to violence. This coach gave her player the mental health support that no one else had even thought necessary or possible. This golfer succeeded with his coach at his side. And the success was not just in golf but also in school. Her golfer is graduating and is planning on attending college. Our nation needs to address the trauma that is often ignored in our young people. Our nation needs to turn to unconventional approaches to inspire mental health and wellness. Yes, trauma can be healed by sports - and yes, the potential of sports to heal our youth, our communities, and our nation through efforts aimed at training our coaches in mental trauma has only just begun.